At 11.00am this morning Tim Owen QC opened the first appeal in the Supreme Court, before a 7 judge panel, chaired by Lord Phillips (see the picture to right). The case involves a classic confrontation between state and individual over “freezing orders” against suspect terrorists. In The Guardian, legal correspondent and UKSCBlog guest blogger Afua Hirsch writes a thoughtful article headed “State and the individual – the supreme court takes on weighty first case”, quoting UKSCBlog’s own Matthew Ryder. 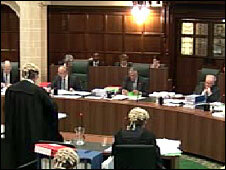 BBC News online wrote about the case under the headline “Supreme Court to hear terror case” – which, in the course of the morning, has become “Supreme Court hearing first case” – with live commentary from inside the Court by a BBC correspondent on his PDA. This is, we think, a first. Justice is intervening in the case to support the appellants. In its press release it describes the case as a “test case for the rule of law”. Its director of human rights policy, Eric Metcalfe, is quoted as describing the freezing orders as a “travesty of proper lawmaking, and grotesquely unfair to boot”. Justice has made its submissions (prepared by Michael Fordham QC, Shaheed Fatima and Iain Steel of Blackstone Chambers) available on line. We hope that, in the future, we will be able to make available all the written submissions on each appeal. Leave a reply on "First Appeal: A v HM Treasury [updated]"